Student life in Uppsala is generally pretty exciting. I would say this is mainly due to the Nations which organize a large variety of activities. I am planning to explain a bit more on what the Nations are and do in another post, but today I want to tell you all about one particular activity: Dancing. Uppsala loves dancing. Every type of dancing! There is a lot going on in this vibrant small city, and lots of it is not for students only. Social dancing – in the sense of partner dancing – is quite big here, and if you ask me, lots of fun! 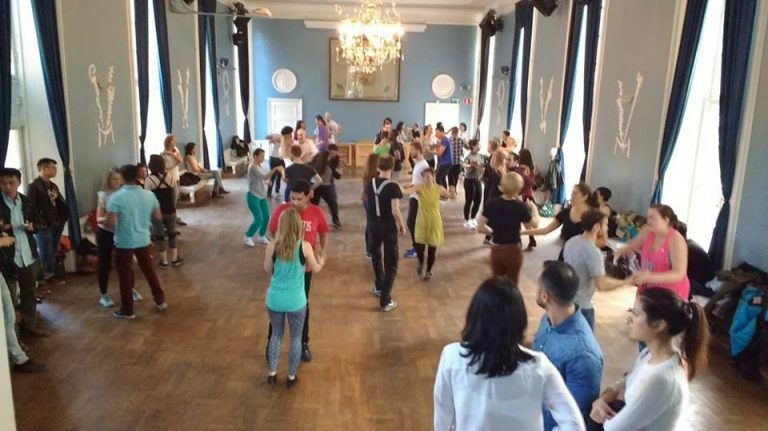 There are several dancing schools in Uppsala that offer social dance. The varieties differ, but in my experience I would say that the most popular types are lindyhop, salsa, bachata and kizomba. The dancing schools offer substantial courses that will teach you any type of dance during weekly sessions given over a certain period. These are paid courses, though from what I’ve heard it’s really worth it and the teachers are professionals. Occasionally the dancing schools organize an event which includes an introduction lesson, sometimes combined to a party. Another option are the dance classes at the Nations. I love these! Both Värmlands and Smålands Nation organize latin dance classes (salsa + bachata) and recently Värmlands added kizomba to their programme. The classes are progressive, but beginners are always welcome and they start every class with a short rehearsal of the basics. I guess you won’t make progress as fast compared to a real course, but still there is a lot to learn. The teachers, usually students as well, are great dancers themselves and create a very easygoing, friendly atmosphere. There are often people represented from all over the world and as you change partner all the times during class you get to know a lot of different people. To me, learning a new social dance is a bit like learning a new language. If you get the idea on the rhythm, it’s only a matter of adding dancing elements to ‘extend your vocabulary’. And like with language, if you know more words, its easier to have fun together. Wherever you come, if people know the basics of the same dance you can join! I can recommend it to anyone 🙂 If you want to find out more, have a look at the website of Uppsala Danscenter, Swingkatten or join the facebook dancing groups of Smålands and Värmlands. And of course, feel free to ask or comment below. 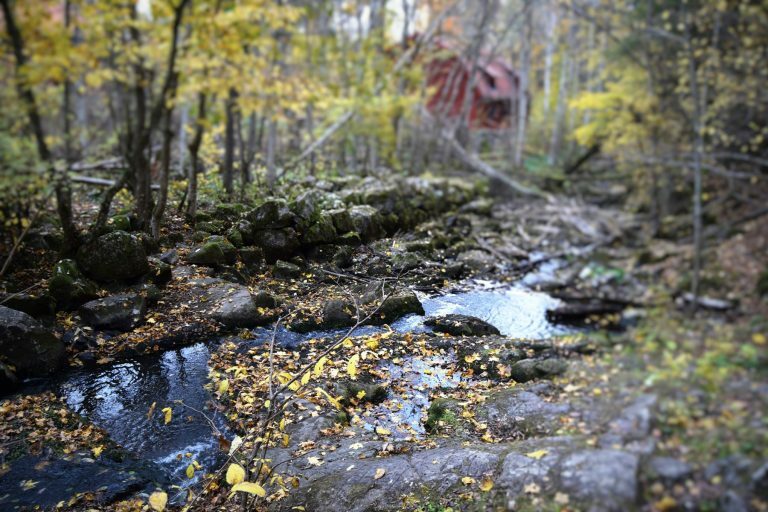 Southeast of Uppsala there is a beautiful forest area called Lunsen. It is not far away from campus at all, next to lake Ekoln and on the border to Sävja, where I went picking mushrooms a little while ago. In the middle of this forest there is a clearing where people have built some basic facilities to rest and refresh before continuing your hike. There is a pump providing drinking water, places to build a fire, an old fashioned hut-type toilet and… a cabin! You don’t have to pay to stay here, but you can’t make any reservations. If you want to make sure you have a place to sleep go early, or bring some air mattresses with you, just in case. Besides the hut there is a grass area where people can also camp. 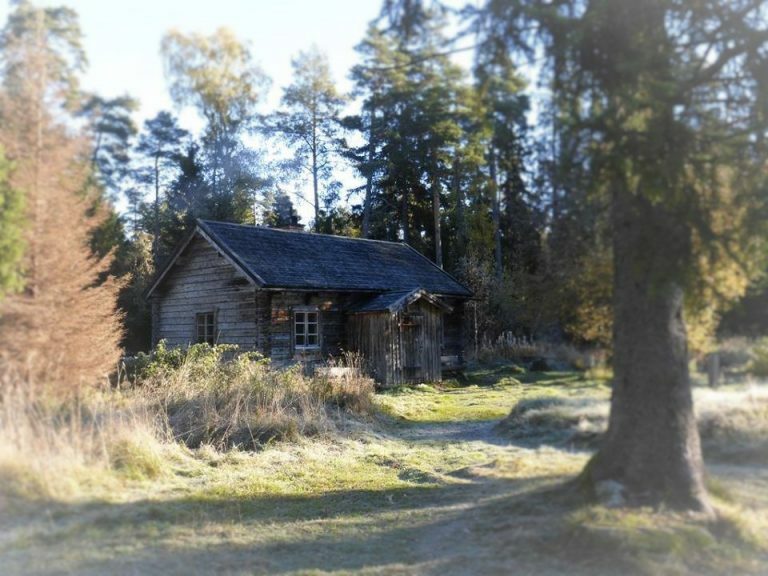 If you want to have a very Swedish experience; gather some friends and hike through Lunsen, build a fire and sleep over in this cabin. It will be worth it. 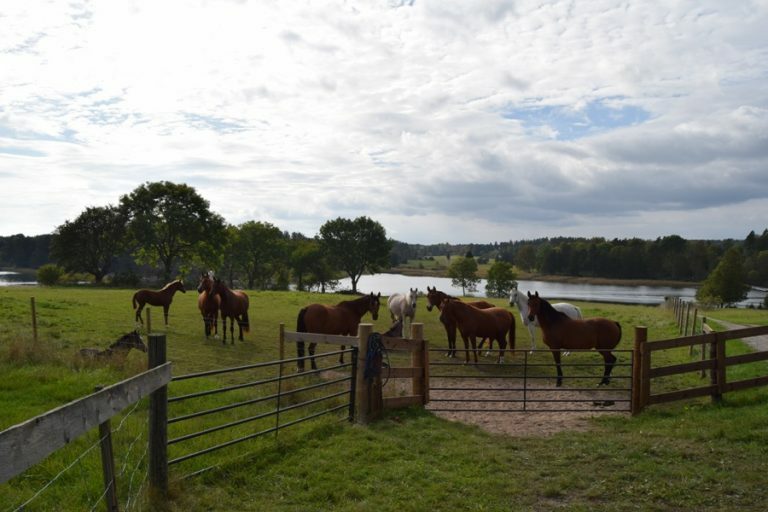 The first study visit for the horse course brought me to the strong, heavy Swedish coldblood stallions that spend their days moving logs and cutting grass (read it here!). This second study visit could not have been more different. For our project work in this course – which I will explain more about in a next post – we went to visit an Arabian horse stud. For those who know little about horses, the Arabian breed is often considered the most elegant of all, famous for its light footed trot. This day we saw some of the most highly judged Arabians of Sweden, but we also learned there is more to this breed than just its beauty. The farm we visited is called Slängsboda and is owned by the family Wale, who have a long history when it comes to breeding Arabian horses. In the past the stud housed 60 horses at a time and at least 150 foals have been born over the years. During the eighties a second location in Kentucky served as a base for marketing the horses in America and Canada. Nowadays they have decreased in size but aim to maintain breeding top quality Arabian horses. This year they have had a very successful season in regard of the breeding shows. Louise Wale and her mother Christina Wale showed us around on their stunning location near the Stockholm Archipelago. It was a lot of fun to ‘meet’ the broodmares and their foals. Both Louisa and Christina are very passionate about the Arabian horse breed and their own horses in particular. They showed what they are looking for in their breeding goal by demonstrating certain features from their own mares. I loved how they really focused on horse health and cared about strong legs and durability. 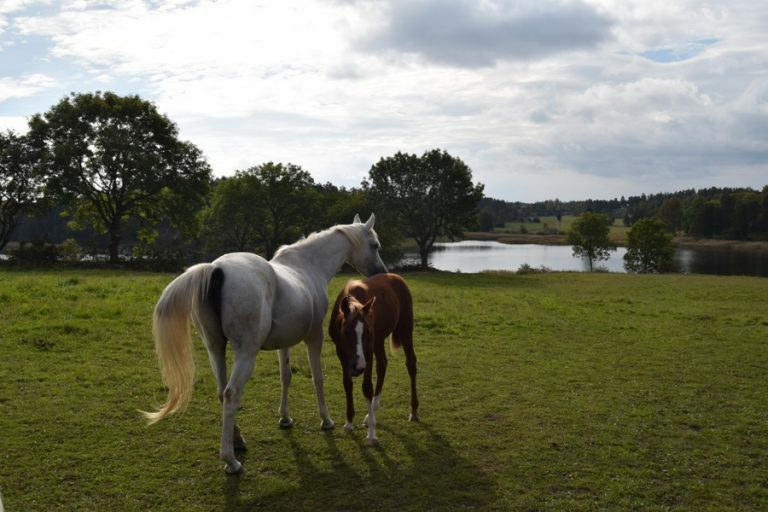 The results of their breeding efforts are impressive: It’s hard to find an equestrian discipline where not one of the Arabians bred by Slängsboda has been successful at. In the upper left Lovisa with Myrica, in the upper right Amanda with Nikolajev and Annika with Baidora. And this lovely nose belongs also to Baidora. After cuddling foals and mares – we could have stayed forever – there was some work to do. We had to collect some data which we will analyse as part of our project. 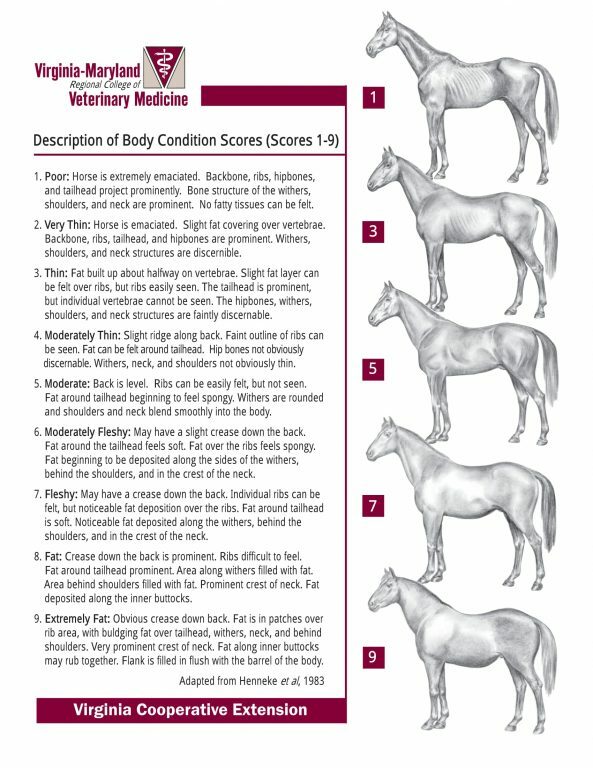 First we took the body condition scores (find out more here) of several broodmares. Later we took feed samples from the hay, both this year’s harvest and last year’s harvest. In a next post I will tell you all about this project, but it’s just a bit much to fit it all for now. If you want to know more about Slängsboda Arabians, definitely check out their website, which is also available in English. In case you have any questions or remarks, please comment below. To be honest I am quite stressed right now. The written exam on the horse course is already this Monday. Even though I went to almost every lecture and managed to pass the multiple choice exams we’ve had so far easily, I am worried. First of all, I started preparing for the exam later than I should have. Ever heard of procrastination? Well, let’s say it’s one of my specialities, and I solemnly swear I wish it wasn’t. Second of all I am worried because the exams here at SLU are quite different from what I am used to. Even though courses provide obligatory grading criteria, the exams remain a bit mysterious to me. It starts with the system of how grades are scored. At home in the Netherlands the scoring runs from 1 up to 10. Here in Sweden the grading is divided in 1,2,3,4,5. You might think: “That’s easy, just double the grade and you are back to your Dutch system!”. However, the reality is very different. A grade in the Dutch system is usually precise on the decimal. For example you may obtain a 6,3 or a 6,4 for an examination. This mark will reflect the exact amount of points you scored in proportion to the total amounts possible. Here in Sweden the numbers reflect classes. Grades 1 and 2 will make you fail; grades 3, 4 and 5 means pass, where 3 is simply ‘pass’, 4 means a ‘good pass’ and 5 is an ‘excellent pass’. What makes it complicated is that every course seems to have it’s own requirements on how to obtain these higher grades. It may be a more in depth analysis on the written exam, it could be handing in extra exercises or a combination of different aspects. When it is depending on the written exam, an example on the requirement for grade 4 could be to score 75% of the points, while grade 5 might require 90%. Therefore you can not really say that a ‘Swedish 4’ is the same as a ‘Dutch 8’, and how to translate a Swedish 5? The forms of examination have also been very diverse. It is kind of eye opening that there are more forms than only a multiple choice exam or a written exam. Here in Sweden I had to make home exams, group exams and even roleplay has been included to pass a course. However every time something new is demanded you’ll be surprised how insecure this can make you feel. This can be especially stressful if the full grade is depending on it. I hope it will improve my skills on being flexible though, haha. One thing that I think is absolutely amazing about examination at SLU is the anonymity. When a written exam takes place, or you have to hand in an essay, you will first be given a number. The list that shows which number corresponds to which person, will not be seen by the examiner of the course. At the end of the written exam, the last student will put their signature on the sealed envelope which will go to the student administration. The student administration will receive the graded exams from the teacher and match these back with the students who made them. In this way the grading is ‘blind’ and can not be influenced by the personal opinion an examiner might have on a student – of which he/she may not even be aware. I don’t know if this is a common procedure in other countries too, but I think the Netherlands could take an example here from Sweden. Allright, I really have to get back to my studybooks now, or I might not even make a 3! And of course I would rather get something higher 😉 I hope this post was not too confusing, let me know if you have any questions. Flogsta… where to begin? First of all, Flogsta is not a touristy place. There won’t be a page in the lonely planet, there is no natural wonder or any real must-see around here. Yet I would like to add Flogsta into this category I started of places worth a visit in and around Uppsala. Flogsta is one of the main living areas for students and ‘a little special’. It is rumoured for it’s wild party’s, famous for it’s 10 o’ clock scream but actually a really nice area to live. Flogsta during autumn. In front the low-rises, the skyline is dominated by the high-rises. A long, long time ago Flogsta was not a neighbourhood of Uppsala, but a former village on its own. The name shows up in literature dating back to the 1300’s, and is based on the old Swedish word Floe meaning something like a ‘body of water, less swamp’. There is still a swampy area, sort of mini-river running along here. Nowadays Flogsta is easy to recognize due to the seven story high buildings, built on top of a hill. There are sixteen of these so called high-rises and twelve of them are home to students only. The apartments date back from the sixties and on each floor you will find two corridors with twelve student rooms each. Corridor parties – BYOB! – can go really crazy here. Last year at the end of the spring term, a whole building teamed up and organized a massive party, offering different types of music on each floor. Then there is this Flogsta scream. Every night starting exactly at 10 pm, students will go out on their balconies to scream as loud as possible. The exact history is unknown, but the behaviour started somewhere in the seventies and it is nowadays a long standing tradition. Screaming at any other time of day or night will not be appreciated nor replied to by other screamers. And make sure you’re ready at 10 pm, punctuality is everything in Sweden. Perfect let-out for all your exam stress! Anything to add on this topic? Reply below. Horses come in many different types and breeds, shapes and sizes. It can be difficult to see whether a horse is fat or muscled, healthy or skinny. Luckily for us, Henneke et al. developed a rather good system to analyse horse body condition back in 1983, that is still widely used. 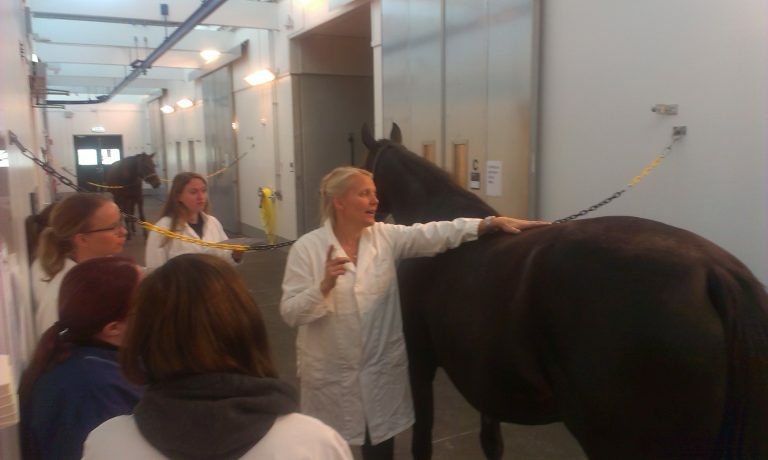 In the past weeks professor Anna Jansson provided us with some very informative lectures on horse feeding and health. Her lectures were so inspiring and thorough, she definitely made into my list of favourite teachers. I like her way of describing the body condition scoring system as ‘a subjective evaluation trying to perfom in an objective way‘. Even though subjective, when people are well trained in this method they can reach very similar scoring outcomes – accurate up to a decimal. To overcome individual differences in scoring, when used in scientific research it is recommended that one person completes all the scoring needed. 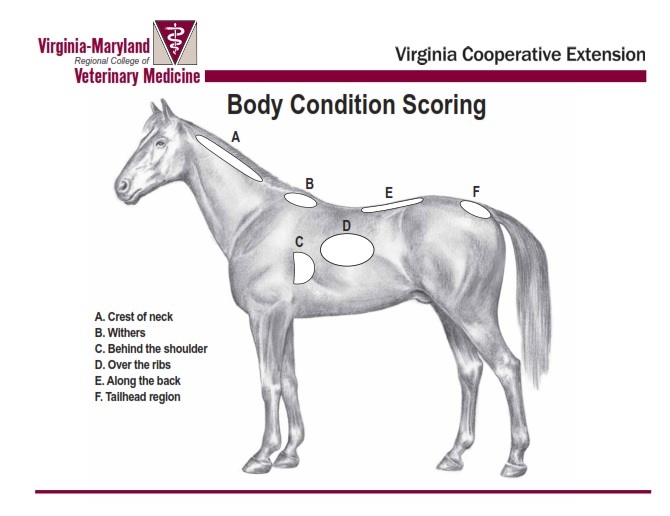 In the picture above you can see which areas of the horse are mainly considered when giving a score. Note how the lower belly is not taken into consideration. The way the horse’s belly looks has a stronger relation to other factors such as forage intake and the training of belly muscles than to fat tissue. It can be very misleading – especially with broodmares – to judge the horse on the size of the belly. An interesting approach we learned during the practical was not to score the horse directly in one number. We had to divide the body into 4 main regions and give individual scoring for these areas first. A&B formed the first region, C&D the second and finally both E and F got an individual number. Based on these four numbers you estimated an overall score. It was interesting to see the difference in fat storage location between different horses. Some horses may seem low in body condition on the ‘middle’, but store fat in neck and or back. Practising body condition scoring in separate parts can also be practical for research purposes. For example if you are enrolled in a study attempting to find whether there is a specific relation between adipose neck tissue and insulin resistance. I think it would be very useful if more horse owners would practise themselves in estimating body condition. Nowadays the amount of overweight and obese horses in Western-European countries is becoming a – literally – big issue. However, I reckon that at least half of the owners with overweight horses think their horses are in a healthy shape. From personal experience I’d say that many owners freak out when they can feel the ribs very easily. Though the optimal scoring – number five – literally says ‘ribs can be easily felt’. 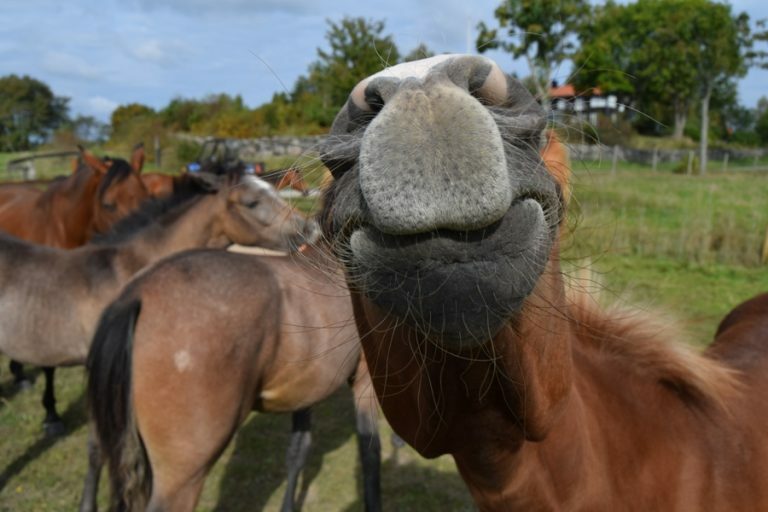 The horse body condition is mainly the result of the feeding and housing management of the owner – the owner has the power to change the conditions for the horse. Owners that do not recognise their horse is being overweight can lead to unnecessary health problems. Any opinion on this topic, a comment or question? Feel free to leave a reply. Often you are so busy with studying and your everyday life that you almost forget you’re actually living abroad. Which is not necessarily a bad thing, as I think in some way it indicates you made yourself at home. And maybe it also says something about how nice Uppsala is. You tend to forget there are some other kind of interesting places nearby… like.. maybe.. Stockholm? Kind of funny isn’t it. This cool capital city is less than an hour away by public transport, yet I’ve visited it only twice last year. I repeat: Twice. This literally means the frequency I visited Stockholm’s airport Arlanda is three times as high. A bit embarrassing really. One of my intentions for this second year of my studies is to spend some more time exploring this fancy city. And today I had the perfect reason. My eldest sister and her husband were spending their holidays in Scandinavia and would pay a short visit to Stockholm. Of course I wanted to spend some time with them while they were around 🙂 We met up and spent the most wonderful touristy day in town. 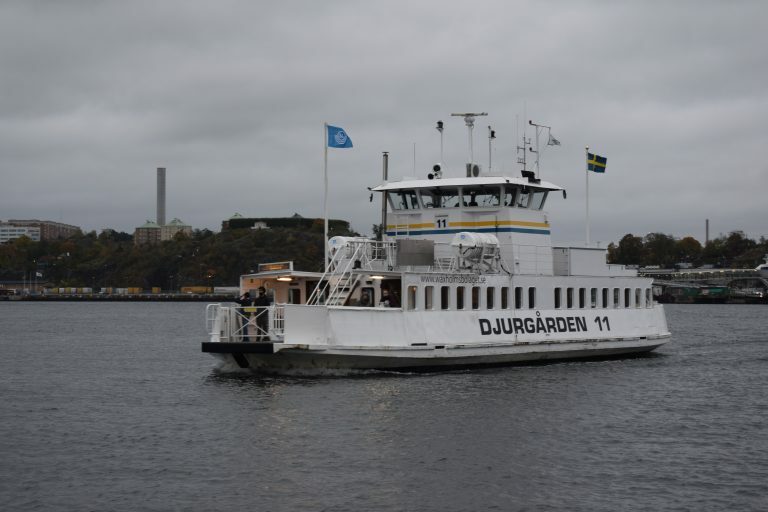 First we took a tram to Djurgården, one of Stockholm’s many islands. This island is for a large part occupied by a beautiful park where we wandered around for a while. Autumn has started to take over now, slowly turning the leaves into all shades of yellow and brown. Even though the weather was not that great, it was dry and simply nice to spend some time outdoors. Djurgården island is occupied by many great museums, such as Skansen, the Abba museum, Nordiska museum and Våsa museum. If you like museums, this island will be your little paradise. Recommended both by friends and the lonely planet, we decided to pick Våsa. 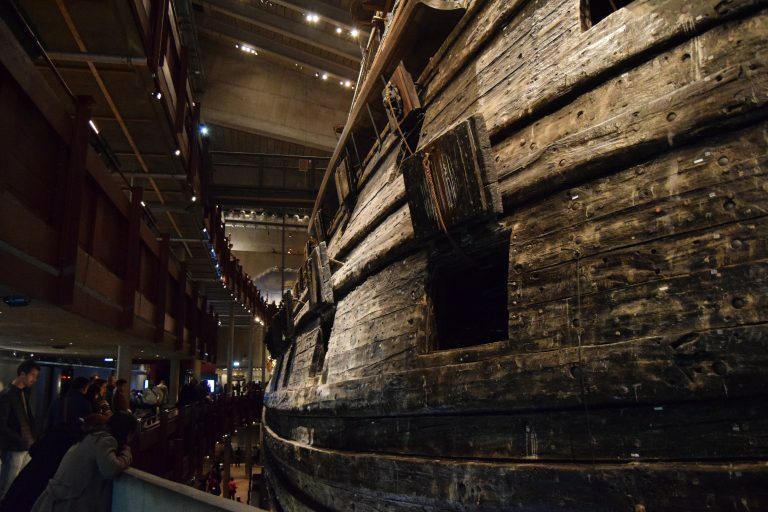 The Våsa museum exhibits a restored warship from the 17th century, which sunk immediately after it started her ‘maiden voyage’. 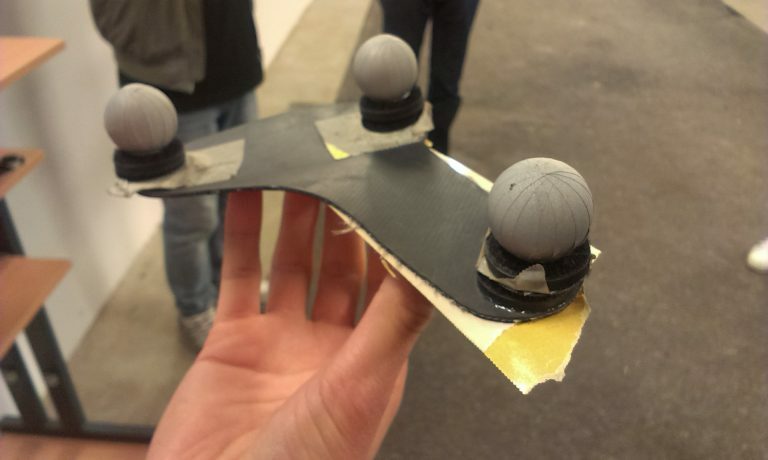 Turned out there was not enough stability in the boat, since the weight distribution was not well designed and the centre of gravity too high up. Oops! 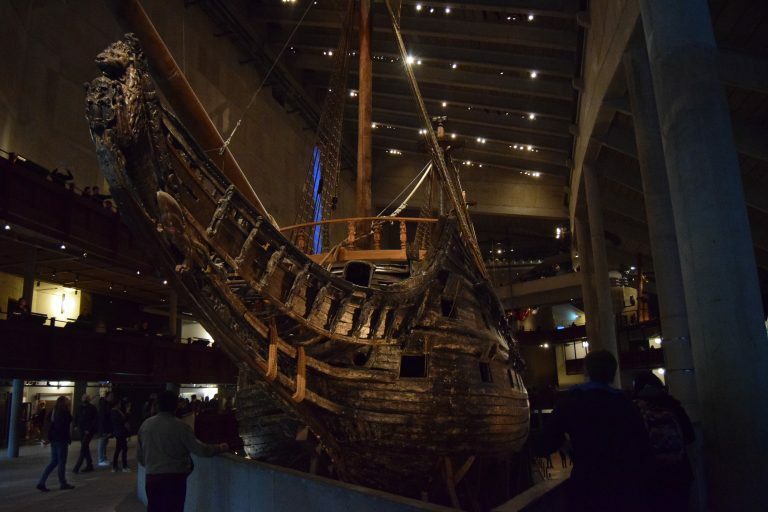 The ship had been built between 1626 and 1628, sunk in 1628 and has been hidden on the bottom of Stockholm’s bay for 333 years. They were able to get the ship as a whole back above sea-level in 1961. Conserved by mud, the boat and a lot of items from that era remain in a relatively great condition. I won’t spoil everything, but if you’re ever in Stockholm I would truly recommend this museum. Not only seeing the ship itself is impressive, the museum is also fun, interactive and informative. 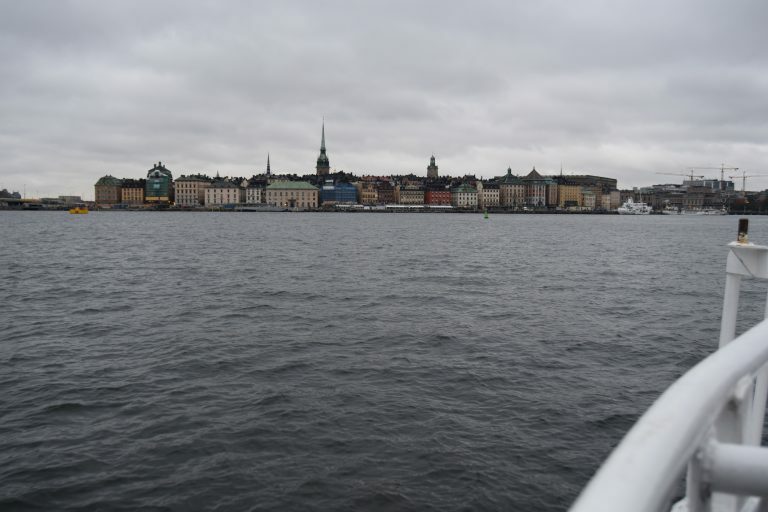 As we wanted to head to Gamla Stan afterwards we took the ferry back instead of a tram. I absolutely love travelling by ferry, and no matter the weather, I’ll be on deck. Seeing a city from the water just gives a whole new perspective. Gamla Stan literally translates into ‘old town’ and as you may have guessed it’s the oldest part of the town, dating from the 13th century. It is located on a small island named Stadsholmen. Besides being cute, unfortunately it’s also extremely(!) touristy. What we did really like though was that the rows of these ‘one of a kind’ souvenir stores were alternated by some stunning local art and handicraft stores. Not very cheap though, ahum, but window-shopping is fun as well 😉 We’ve had a great time together and after a lovely dinner it was time for goodbye and I had to head back to Uppsala. Dear Stockholm, I’ll be back! 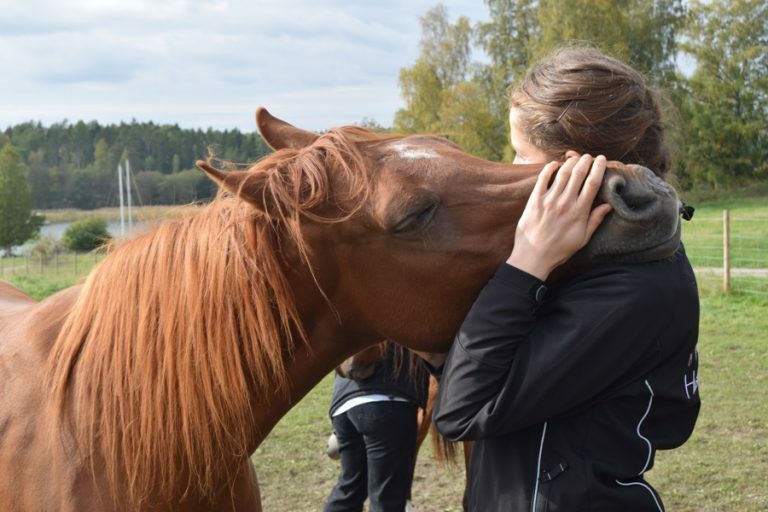 While all over the world the 4th of October is dedicated to animals, the Swedes have an extra celebration. 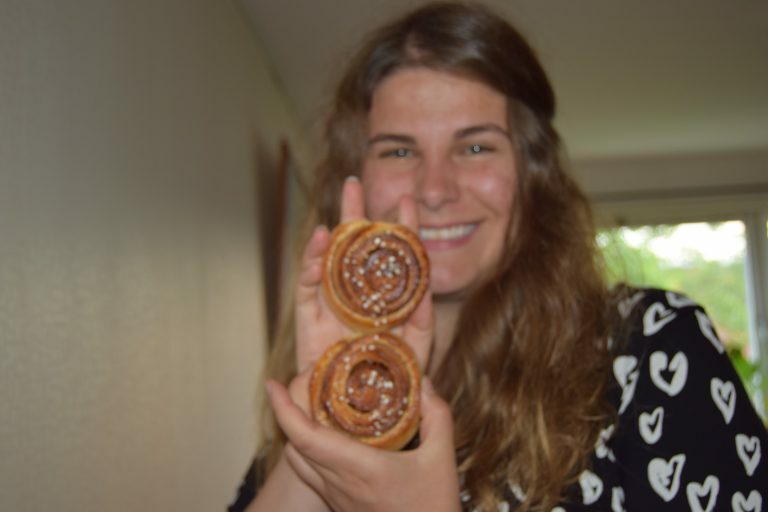 The fourth of October is the day of the kanelbullar, which is the famous Swedish version of a cinnamon bun. Probably it is more correct to name it the ancestor of the cinnamon bun. ‘A national day dedicated to candy?’ I hear you think. 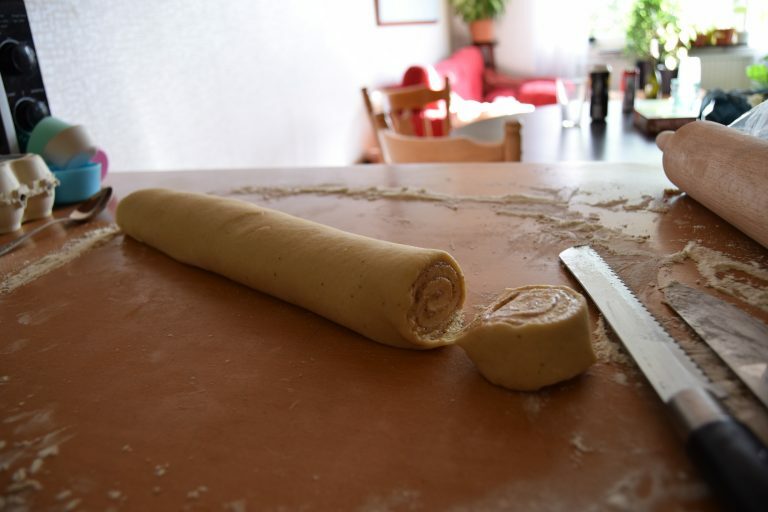 Well – surprise, surprise – and this is not even the only national day for a pastry! Another typical Swedish treat called semla or sometimes fastlagsbulle has it’s own day somewhere in spring. In other countries this day is also called ‘shrove tuesday’ or ‘mardi gras’ as it’s the last day before the fasting period starts for some religions. Both semlar and kanelbullar are typical pastries one could have for fika. Nothing one could love more about Sweden than it’s typical tradition called fika. Translating it into ‘coffee break’ would do this cultural habit no justice. It is a break from work, a moment to be social with colleagues or friends and should preferably be accompanied by some… pastries! 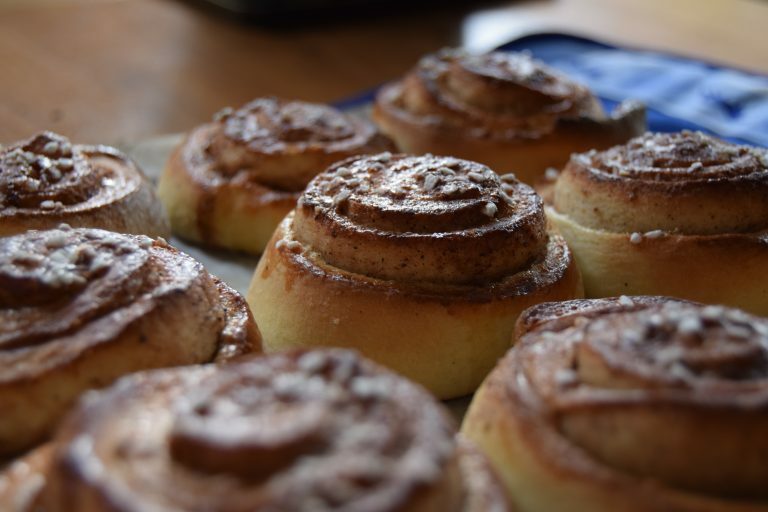 Traditionally kanelbullar, but nowadays you will be having a hard time to choose from all the delicacies when going to a fikaplace. And trust me, they are very good in baking over here. Swedes really love their candy. I think it was the first thing my parents were totally surprised about when they moved me to Sweden. My mum could not believe seeing all these candy stores, while my father felt very tempted by all the godis that is excessively displayed in every supermarket. However the average Swede does not at all look as if they visit these candystores that often. That is actually the whole point. As a Swedish child you grow up learning that there is one day for candy; lördagsgodis. Which translates into candy saturday. No idea how these candystores survive during the rest of the week! To celebrate that it is(or ehm, actually was already yesterday) the official day of kanelbullar, I will place here the link to my favourite recipe of this Swedish goodness. If you have a hard time figuring out the Swedish language, google translate is your best friend. 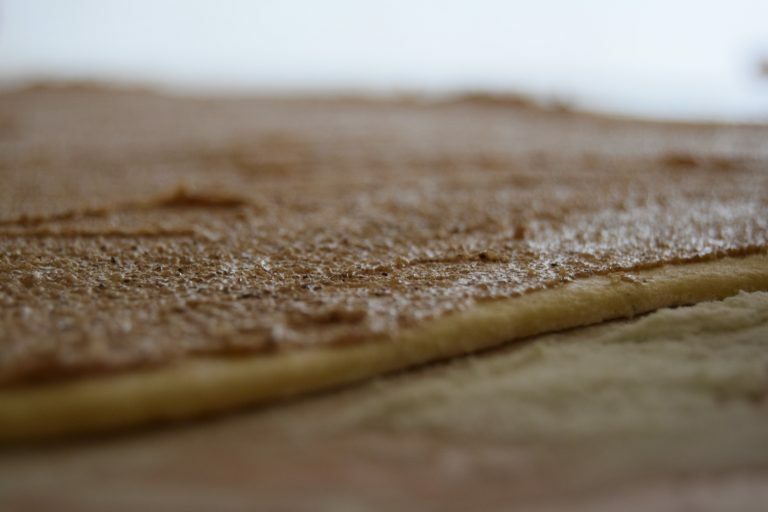 One very important tip I got from several Swedes: Double the amount of the cinnamon filling, so they become super smudgy. Unfortunately I didn’t have time to bake yesterday, but made the photos a few months ago. Back to the fabulous horse-course. It’s going so fast, I wish I had more time to write about everything. 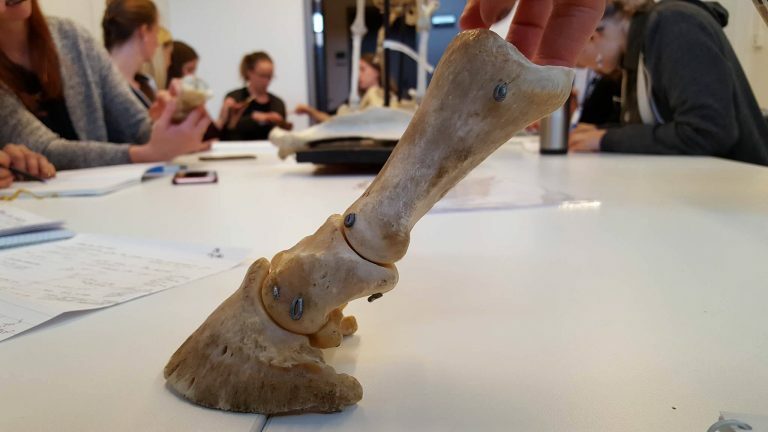 Last week we’ve had some very well presented lectures, about gaits and locomotion, anatomy and other aspects combining the use and biology of the horse. One very common reason for horse owners to bring their horse to the veterinary clinic are problems related to the horse’s locomotion. The horse is lame. The horse keeps being lame. The horse is lame every now and then. The veterinarians have different opinions about on which leg the horse is lame… Long story short, lameness is often vague, the cause can be hard to find and it can easily turn into a chronic problem. To put it into perspective: Lameness is one of the most common reasons for horse euthanization. One of the leg models during anatomy class. Photo by Jasmine Lindholm. …when we were putting theory into practice! On tuesday we had a whole morning in the stables. We went palpating horse legs from four different horses. After a short demonstration it was time to see what we remembered from these bones. Some joints were easy to find, others were more challenging. Luckily the ‘school horses’ are very well behaved and were very patient with us while we were pushing around all over their bodies. And after lunch we were invited to join another lecture about lameness. This was actually a bit of a special event as the class was organized for some top riding talents from Europe. The main topic here was on new techniques that have been developed to detect lameness. And hopefully not only to detect an already existing lameness, but to find asymmetries already in a much earlier stage. 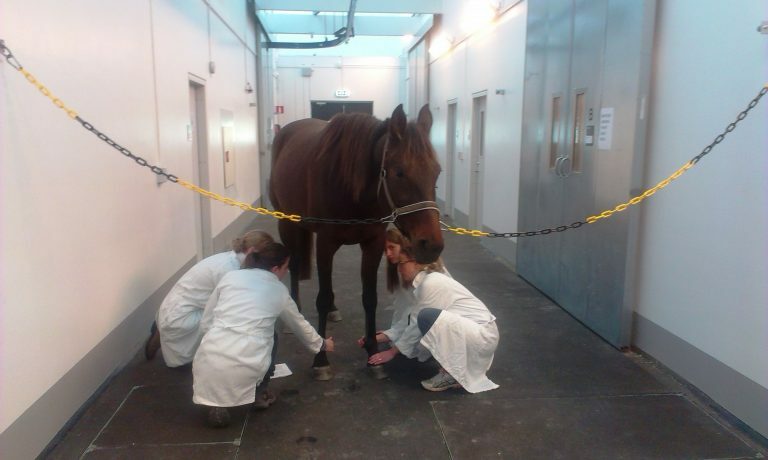 One of the fascinating new methods made use of sensors over the horse head, withers and back. By looking at the differences in swing movement deciding which leg was causing the problem suddenly becomes a simple equation instead of a vague puzzle. Modern technologies can be really great sometimes. There are always a lot of interesting things going on in Uppsala. Sometimes there are other lectures organized that seem just too interesting to miss, even though you already have had a full week of lectures. I absolutely love lectures – and always have – but even I have a limit, haha. Therefore I actually skipped my afternoon horse class(the guilt, it feels terrible!) to be able to be fresh again to join another lecture in the afternoon. This lecture was organized by CEMUS, which stands for the Centre for Environment and Development Studies(I guess CEDS didn’t sound as catchy?). 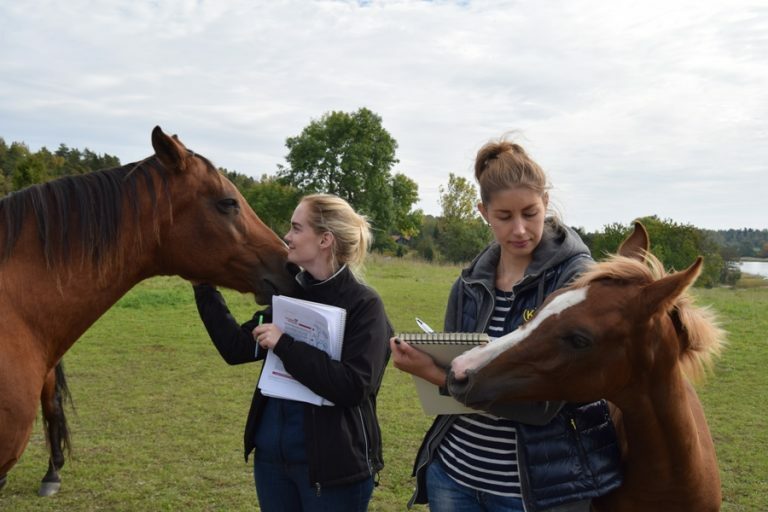 CEMUS is a collaboration between Uppsala University and SLU, it’s student-initiated, trans-disciplinary and aims to contribute to a more just and sustainable world. I know, that’s a lot of fancy words all together, but they actually do a lot of pretty great things and if you have some time, definitely check out their webpage. The lecture I attended was called ‘Ignored History: The Sami Perspective’, and the main speaker was Josefina Skerk, who happens to be the Vice-President of the Sami Parliament, even though she is only a few years older than me. Impressive. But that was not the main reason I wanted to go. The thing is, I have lived for about a year now here in Sweden. I have the feeling I got to to know quite a bit about Swedish everyday life, culture, habits and some history. 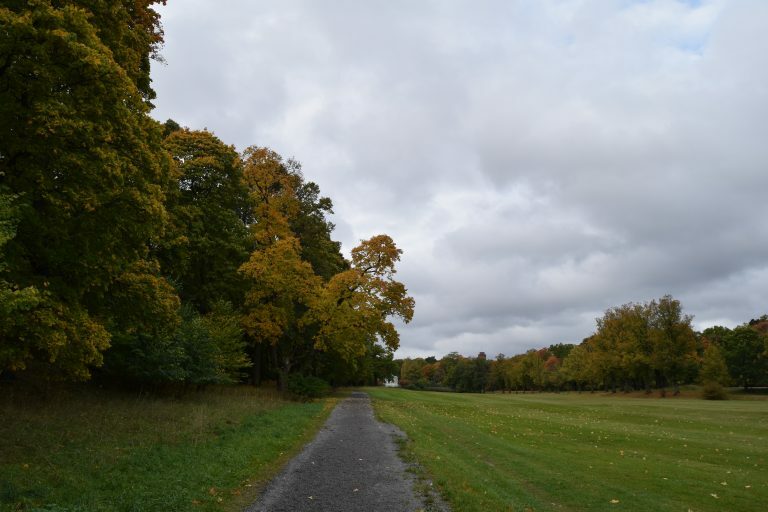 There’s viking hills on several places around Uppsala, our campus used to be a viking settlement, the university proudly gives away necklaces with a little horse pendant – a replica found on the grounds of Ultuna. Yet I haven’t heard a thing about the Sami people. Maybe it’s my own fault, I don’t know, but I wondered why. Are there no Sami roots in Uppsala? Are people not proud to be Sami? Or are there no Sami people left in Sweden? So yes, the announcement of this lecture caught my attention, especially the article by Josefina Sterk that was posted along with it, which you can read here. One part from this article caught my attention specifically. Josefina writes “But as the lands are becoming more and more scattered and poisoned by mines and other destructive industries, we are rapidly losing the possibility to adapt to changes. Sweden is now officially aiming to become the mining center of Europe. There is simply very little regard for our ties to the land, our human rights, and for sustainability.” Wait! What? This does not sound as the Sweden as I got to know it. Isn’t Sweden the country that aims to become climate sustainable? Wasn’t it all over my facebook a few months ago that Sweden attempts to be the first fossil-free country of the World? Something before 2020? This sounded extremely contradictory. Even my Swedish roommate Oskar, who usually has an answer or opinion ready on almost everything, seemed surprised. So in the end I wasn’t going alone to the lecture, Oskar was joining too. Sami: One people in four countries. Map of Sápmi in 2007. Click to enlarge. 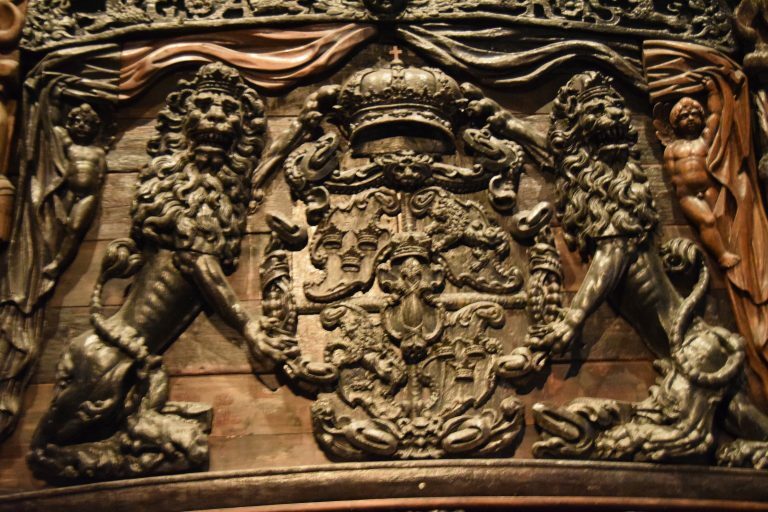 Copyright Nordiska Museet. In my opinion the lecture was really, really great. I learned a lot of things I didn’t know before, to me Josefina’s presentation was not only educative but also personal, informative and sometimes slightly shocking. Of course I won’t be able to write about everything she told. The good news is that if you are EXTREMELY interested, the whole lecture was filmed and is accessible to anyone. Therefore I’ve included it into my post, you will find it if you scroll all the way down. The other good news is that I did take a lot of notes, so in case you don’t feel like watching the whole lecture, but made it this far reading, you can just keep reading a little more about it. There are a lot of prejudice about Sami people, such as every Sami being a reindeer herder. However, only 10% of the Swedish Sami are active as reindeer herders. Another issue Josefina adressed was the following: “We are not stuck in the 1800’s. We don’t like to be treated as if we’re stuck in the 1800’s.” Fair point well made, I believe. Let’s jump to some facts. There are currently between 20.000 and 60.000 Sami people living in Sweden. About 75% of them are still able to live in their traditional areas. Note: Traditional land is really important to the Sami people, they have very strong personal and cultural ties to the lands, that go back many generations. The Sami are one people divided over four countries: Norway, Sweden, Finland and Russia. They used to live much further South in Sweden, but have been pushed North. When it comes to land rights, according to this presentation, the Sami are not in a great position. The Sami people have no right to decide and/or exercise influence over land, water and natural resources. The Sami Parliament – which represents the Sami people – is not considered and affected party(only reindeer herding districts). The Sami people have no right to a part of the profit earned by companies exploiting traditional Sami land. Sweden has a lot of sustainable ambitions. One of them includes building a lot of windmills as part of becoming fossil free. However, many of these windmills are built in the Sami lands. Without the Sami having any say in where they will be built. The Sami people want to have input in these matters, the Sami Parliament wants the Swedish government to talk to each other about such things. Josefina put it nicely together, saying “We want to fight climate change. But we want to do it together.” One issue she does not know whether talk will be able to result in a solution is the mining. Mining in Sweden is mainly done for iron ore(I had some trouble realizing what this translates to in my own language, but maybe you remember it also from the Settlers game?) and takes place in large numbers. Sweden is responsible for 98% of the iron ore exports from Europe. The problems are that the lifespan of these mines is about eight years only and it really destroys the land. Furthermore it is very expensive to clean-up these mines afterwards and it seems that some dirty financial tricks are being played by large companies, leaving the lands ruined behind. I could keep talking(erhm, writing) about more issues concerning the Sami for a long time, but I think this post has already kind of made my records when it comes to length. I just want to briefly summarize that what the Sami people want, or at least what the Sami parliament wants, is more responsibility when it comes to land and issues. Plus that it is really strange that Sweden isn’t teaching anything about Sami in school. Josefina sometimes encounters facing people working in the government who have sincerely no idea of who Sami are. Shame on you Sweden. I am very curious to your opinion on the matter. After all I do have the feeling I kind of heard only one side of the story. But it was a strong story, one I think deserves more attention. ps. For the die-hards that made it all the way down, hereby the whole presentation!